But today, I simply love connecting online! You see, I discovered a group on FB for Alcohol Ink and Mixed Media artists. I put fear aside and hit “join group” request. They graciously let me in and I am so inspired. I discovered many secrets to using alcohol inks in a very short amount of time. Their creations are amazing and hopefully I can share some of those creative souls hear sometime soon! In the mean time, enjoy my latest attempt at a land/seascape called… After the Storm. 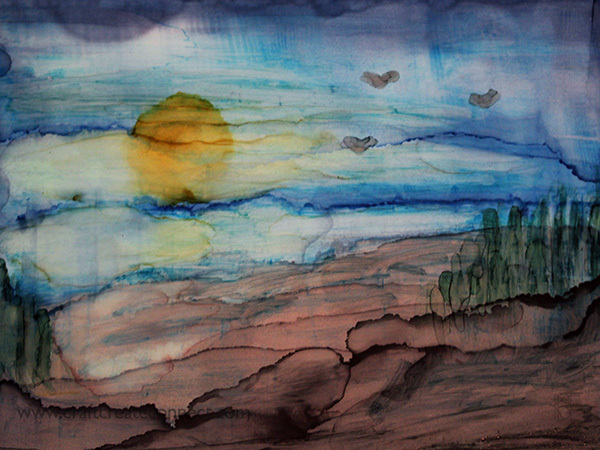 It was created with alcohol ink on Ranger glossy paper.